Well greetings friends, this is Herbert W Armstrong with the Good News of the World Tomorrow. Once again here we are coming in to the time of Lent, pretty soon 'Good Friday' and Easter will be rolling around. Now where did we get those things? Why do we observe them? Why does anyone observe Lent? Where did it come from, do you know? That is an old tradition. But my friends where do all of these traditions come from? You know it's been commonly supposed that Jesus was crucified on Friday and so it's called 'Good Friday' and that the Resurrection occurred at about sunrise on Easter Sunday morning, or just before the rising of the sun. Now it would seem that no one until very recently ever thought to question or to prove this Good Friday — this Easter tradition and yet your Bible tells you to prove all things — if you believe in the Bible. And you're going to be literally astounded by the proof. Now I also have a booklet on 'The Resurrection,' proving that very thing; get this booklet — don't believe the booklet — believe what you see in your Bible but it will show you where it is and then open your own Bible and read it there and believe what you see there. Don't believe me, don't believe our booklets; but read them and listen to them with open mind and search and research and get the proof and know why you believe the things you do. Why you do the things you do. Let's have the intellectual honesty to face these things. Your Bible prophesies that in this day all nations would be deceived. Could we be deceived on such tremendous things as Easter and Christmas and things like that? My friends do you know that the early Church of God that Jesus Christ built; the Church He said He would build; the Church that was headed by Jesus Christ Himself then visibly on Earth by His apostles — do you know that they never observed any Easter? Do you know that they never observed any Christmas, any New Year's Day like we do at all? Do you know where these things came from that we call Christian? 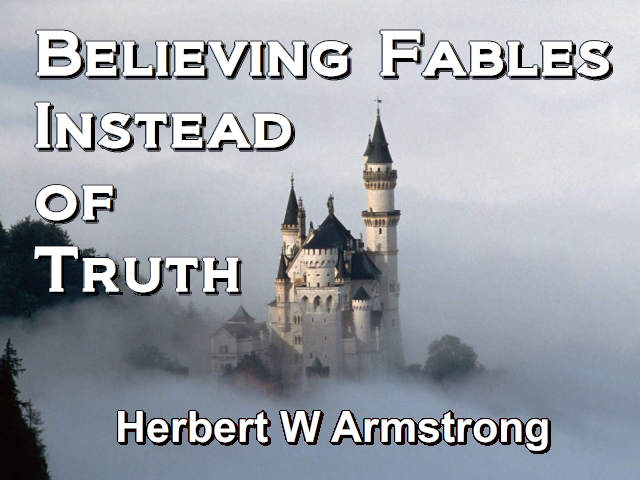 Your Bible says that you today would be embracing and believing fables instead of the Truth of God. But my friends you're living in reality and it's time to wake up. Now I have another booklet I'd like you to read; 'Easter.' About Easter, I'm not going to read the rest of the title to you, it's a little bit shocking. Yes, it's just a little bit shocking but this will tell you where Lent came from. It will tell you where all of this came from; how did we start celebrating what we call Easter? The Resurrection was not on Sunday. Get the booklet on 'The Resurrection.' And then get the one on 'Easter,' and it will give you the very carefully and authentically documented history on Easter and where it came from. Now you can check all the biblical part in your Bible and the historic part you can go to any public library and get the books and read them right there yourself. And where did Lent come from? You want to get the history of that; it's going to amaze you. These things are mighty important, mighty important, so write in and get them. I'll give you the mailing list now and then I'll give it to you again at the close of the program — so you better get pen, even a pencil if you don't find a pen around there some place, and get an envelope. If you're riding along in your automobile right now listening by your automobile radio, why don't you just pull over to the side and park and jot this down, right now so you won't forget it? Put it on the seat beside you someplace so you won't stick it in your pocket even and forget it. To write in for the Plain Truth and that booklet on 'Easter.' and the booklet on 'The Resurrection.' Now I'll announce that again at the close of the program so get it in right away. Now here we are going through the book of Jeremiah, one of the prophecies: a specific prophecy. One third of your Bible is prophecy and about ninety percent of that pertains to the time in which we live and the immediate years ahead, the next five, ten or twenty years ahead. You certainly want to know what's going to happen. You're going to live in to these times; you're going to live through these times unless something happens to you in the meantime. Is there anything as important as that? These are the most important things in your life. But now I'm going through some specific prophecies, not taking every word but, at least the essential parts that contain a prophecy for us today. Now here in Jeremiah's prophecy we're in the fifth chapter and he is speaking about the United States and what's going to happen to us and the democratic nations of the Western world, we are all included in these prophecies, the British people, even the Swedes, the Danes, the Norwegians, the Dutch and all of those nations in North Western Europe. He was speaking here of Judah, we had come to the fourth chapter where he was giving a warning of what was going to happen then, 600 years before Christ. More than 2500 years ago now what was going to happen to the Jews there in Judea, the southern part of Palestine at that time just before Nebuchadnezzar invaded them. Israel means our people today; now that's the most astounding thing that you ever read. But I was challenged on it and I studied this thing with an open mind. And I studied it for many, many months, thoroughly. And I had to acknowledge the truth as you will if your mind is open and if your heart is willing to let God show you and teach you some things that are now being revealed. You know my friends that prophecy mostly has been closed and sealed until now. You'll read that in that in the twelfth chapter of Daniel "...the words are closed and sealed up until the time of the end...when knowledge will be increased, many will be running to and fro…" (Daniel 12:4 KJV paraphrased), just as we're doing in this day, right now. From war or famine, now my friends I've been telling you that the prophecies ahead for the United States of America for the next few years that you're going to live through show some frightful changes in the weather. We're already beginning to have it, yes, we're already beginning to have it. Here in the United States we've had nothing but topsy-turvy weather. We have seen a time when it was colder way down in Palm Beach or in Miami, Florida than it was up in Portland, Maine. When Portland, Maine was having warmer weather than Miami, Florida, think of that. We have been in a time when we have been having floods in California and Oregon such as we have never known before. We're having drought where they formerly had plenty of rain. This weather is going berserk and I want to tell you my friends that all nature is shuddering, it's shaking with convulsions because of what's coming on this earth. You're living in mighty dangerous times, these are not normal times and you'd better be awake to what it all means and where it's leading us and you're going to live through it. Now I've been telling you that it is prophesied that a national famine is to come to the United States, also there is going to be an invasion of the United States and World War III and this time we're going to be invaded. My friends, you're not hearing some wild crack-pot idea dreamed up by some man that doesn't know what he's talking about. You're hearing the prophecies of God Almighty; and God help you to open your ears and realize the seriousness of this thing and not to take it so lightly. Not to think, "Oh well we hear everything today, we hear any old kind of a crack-pot and we hear all kinds of fanaticism." Yes, I know you do. But can you tell a true voice when you hear it my friends, it's in the Bible if you don't recognize the voice, it's in your Bible, believe what you see there, blow the dust off of it and begin to read it for yourself. Because I want to tell you, if what I say is true someone ought to be shouting that warning to this nation; because our statesmen and politicians down in Washington don't know it's coming. Someone who does know ought to be warning the people. Why we're beginning to say today that the hydrogen bomb and the weapons we have are so terrifying, so destructive there'll never be another war because no one would dare start one. You really believe that? Weapons are made to use; and they've always been used. And there's no time — just look at the lessons of history. Men never invented any new kind of weapon yet they didn't put to use. Now here's what the people are crying out, that God isn't going to do anything, it can't happen here, oh no, it'll never happen here, no suffering from war or famine when God's prophecies tell you that both are coming on our America. "The prophets [the people say] are but windbags" (Jeremiah 5:13 Moffatt paraphrased). That is God's prophets that shout this truth. My friends, if you think I'm a windbag God have mercy on you when this happens. Now there's a protection for you, there's a protection for our whole nation, this whole nation could stop that from happening if we'd wake up. I don't think we're going to wake up so I think you'd better do it as an individual and come under private individual protection of God Almighty before it happens. The people say, "The prophets are but windbags; the Word is not with them" (Jeremiah 5:13 Moffatt)! No, but the prophets of Baal deceiving the people have turned the Word of God upside down and God says "...my people love to have it so" (Jeremiah 5:31 Moffatt)! They seem to love error instead of truth; truth seems to offend and hurt our feelings. Why? Why should it my friends? Listen my friends, while Jeremiah was an intermediary between the kings of Israel and king Nebuchadnezzar of Babylon, and while he had a definite mission of warning the Jews of that time then, Jeremiah is one of the major prophets of your Bible. And as a prophet he is foretelling what is going to happen in the future; and so he is telling here now about an invasion and a captivity to come to Israel and there has been no captivity or invasion coming to Israel from the time he wrote that. You know my friends; that these prophecies begin even back in the writings of Moses. There's a lot of prophecy, even back in the writings of Moses. Alright, now let's see, we're down here to about the nineteenth verse. And I'm reading it incidentally from the Moffatt translation because I think you get the meaning a little plainer, it's in more modern English. Now I suppose some of you might deny that, that we have ever forsaken God here in the United States to serve foreign gods in our land. You deny that? My friends some of us need to wake up and get the facts and see what we have been doing. We have been actually serving old Baal the sun god and that ancient goddess Easter right here in some of our chief so-called holidays we call Christian holidays that aren't Christian at all. We've been doing things we didn't realize we were doing. We're in the time that your Bible said when men would be turned to fables and turn away from the truth (II Timothy 4:4). We're in the time when your Bible said all nations would be deceived; and our people have been deceived. We've done that just the same as ancient Israel. Do we tremble at the very word of God? How many of you are really trembling when I read these things right out of the Bible, that are going to happen, that you're going to live into? Not very many of you; some of you smile, some of you take it lightly, or you listen; maybe you're a little stunned by it but you don't pay much attention. Are you really taking this seriously? This is the most serious thing in your life. This is your life, this is speaking of your country and your time in which you live. God Almighty thought it was important enough to have this inspired and have it preserved in spite of every effort to destroy the Holy Bible. It has been preserved until now. And I'm offering to send you the absolute proof that these words are inspired by a supernatural God; and that prophecy is always fulfilled exactly precisely on time. You don't have to guess and you don't have to doubt and be in doubt; you can know. And God says proclaim this to the house of Jacob and I am proclaiming it. God have mercy on us, I don't know of another voice that is proclaiming it. You can call me all of the fanatical crackpot names you want; I want to tell you that I am speaking by the authority of Jesus Christ. And a lot more of you people had better begin to heed because this is coming; and some of these days my voice is going to be stilled. And then there are millions of you that are going to know that God had sent one to warn you but you thought, "Well it was just one voice out of so many. You couldn't believe that; well what could that fellow know?" Surely that's what the people say. You let someone come with the craziest really crackpot religion that ever happened and they can get at least thousands and hundreds of thousands of followers; but you let someone come out with God's truth and the people don't believe it. We want to believe anything but the truth of God Almighty. Someday we're going to wake up and find what is the truth. Our sins have certainly increased. There's more crime in the United States than any other nation now on the face of the earth or any other nation that ever did live on the face of this earth. We're having an actual decay in religion. We're having an increase in interest in religion, an increase in curiosity and interest, more people are going to church now than ever before and yet we're having an actual decay when it comes to anything that really takes hold of our lives. It's about time my friends that we come to realize the truth because the day of reckoning is just around the corner and it's speeding down on us a lot faster than you're speeding trying to keep ahead of the traffic on the highway, maybe speeding into an accident too. My friends God is not mocked; we think God's gone way off someplace. Let me tell you there's a day of reckoning coming and God is cataloging all of these things, He knows what's going on in our United States. Continuing next verse 30: "A horrible thing, an appalling, has happened in the land: the prophets [now this is the overwhelming majority of the — and prophets is a word that a, well, we just call it preachers today. Prophet is a word that can mean one who foretells to whom God reveals by inspiration certain future events and prophecy; or it also can mean just one who is a preacher. And here it means the preachers. Let's just read it that way then], the preachers prophesy falsely [or preach falsely], the priests rule at their beck and call, and my people love to have it so! But what will you do at the end of it all" (Jeremiah 5:30 Moffatt)? Because there is an end coming and there is a day of reckoning ahead. And I wonder, sometimes I think I'm wasting my time my friends to tell you these things. Wouldn't you rather be just amused and entertained? Wouldn't you rather just pass away the time not knowing what's going to come on you? Or would you rather be warned before it happens and have a way to avoid all of this so it need not come? You can avert it, you can avoid it, you can have supernatural protection, it doesn't need to happen to you. But it's going to happen I'm telling you. You can go on lulling yourself to sleep, you can go to the movies, you can see the crime pictures and look at it on television, you can lull yourself to sleep with pleasing things that amuse and entertain you, and you can hide the truth from yourself. But there's going to be a day of reckoning. On the other hand you can open up your ears, and you can open your mind, and you can really begin to tremble at these things and the reality of them; they're coming from God Almighty. And you can seek the Eternal your God with your whole heart. And you can come under His protection and then you'll have only happiness ahead. Now it's up to you, you're going to make your decision. You're hearing the prophecies of God Almighty and God help you to open your ears and realize the seriousness of this thing and not to take it so lightly, not to think, oh well we hear everything today, we hear any old kind of a crackpot and we hear all kinds of fanaticism. Yes I know you do. I've been giving you the Eternal's word; is it a disgust or a delight? Of course these warnings are not so delightful in a way. The Authorized Version has it a reproach rather than a disgust too, incidentally. And I read it here in the Moffatt translation. Dropping to verse 12: "Their houses shall be turned over to strangers, their wives along with their lands. For high and low alike are all greedy for gain; prophet and priest alike are all deceitful" (Jeremiah 6:12 Moffatt). That's the ministers, the wealthy men, the laboring men. Well you read of it my friends in the fifth chapter of the book of James, in James' prophecy near the end of your New Testament. And so labor was trodden down, and just as you read back here in James five: the wealthy men withheld the hire, that is from the laborers, they didn't give them a fair share of the, what they were producing and consequently labor organized and we had labor unions (James 5:4-5). And now I find that labor unions will take an unfair advantage when they get a chance to. Management and capital will take an unfair advantage if they get a chance. I'm not naming names. I'm just talking in principles but its human nature. And it doesn't seem to make much difference which end you're on — whether you're poor or whether you're rich, whether you're a layman or whether you're a preacher. I want to tell you that every one of you has in your nature, a nature of greed and a nature of selfishness and the nature of vanity. Nearly every woman certainly, would just love to be told she's pretty; she'd rather hear that than almost anything. She just wants to be pretty and she wants people to think she's pretty. And nearly every man wants to feel he's important, at least he would like to. I don't know, a lot of men don't work hard enough at it to become important, I don't know whether men really want to be important or not. If they did it seems to me they'd work a little harder to become what people would think is important but most people don't. And so we'll have to end there until the next program carrying right on then in this sixth chapter of Jeremiah's prophecy. We're going to get to some other prophecies right away. All right now my friends let me tell you once again these booklets I asked you to write in for; if you want to know where we're mentioned in the Bible — the booklet 'The United States in Prophecy' and I mentioned the booklets on 'The Resurrection,' and the one on 'Easter.' Now there's no subscription price, there's no charge for the booklets. Until tomorrow then, goodbye friends.